My kids don’t go to school yet so every day is still like summer vacation, but I remember when summer would pass the half way point, summer got a bit different. We were either stir crazy and trying to find new ideas on what to do, or trying to make the best of every last bit of remaining summer. How was I ever “bored” as a kid?! A college lecture hall is the epitome of boredom, not a room full of toys or a big backyard full of stuff. KIDS! Why are you bored?! Enough of my rambling. Today’s guest poster for the Summer Block Party will give us some fun ideas for creating a mini golf course in your own backyard! My favorite part is that this idea will take up two days: a rainy day and a sunny day. Brilliant! Looking for a fun backyard activity for the kids this summer? How about a round of golf? 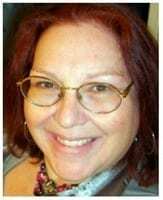 Hi, I’m Cyn from Creative Cynchronicity, my home on the web where I blog about anything that brings a little fun and creativity into your life: crafts, cooking, kids, pets, and more. Thanks so much to Ann Marie for allowing me to guest post here today and share this cute idea for having some fun with your kids right in your own backyard! 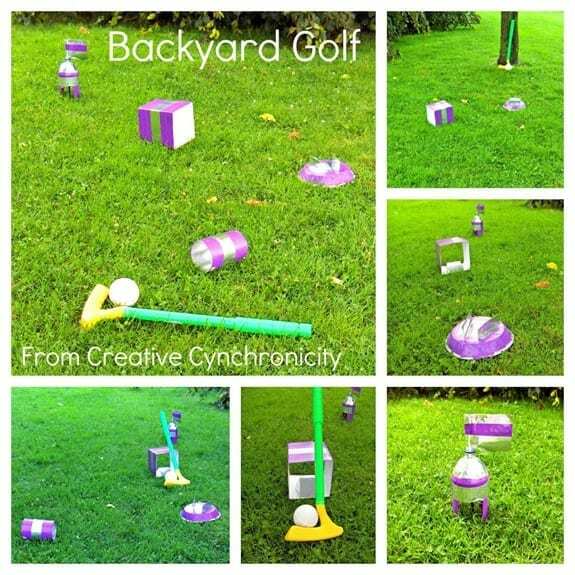 For this backyard golf course, I just scrounged through my recycling bin for odds and ends like cardboard boxes, tin cans, aluminum pie plates, and 2 liter plastic pop bottles. To add some colour and durability to the items, I used silver and purple duct tape to cover each of them. A great rainy day activity would be to give your kids some of these items along with some acrylic craft paints or even things like buttons, ribbon, and rick rack and let them go crazy decorating the holes and obstacles for the course. Then on the next sunny day, they’ll be all set to play outside! I’m using a golf club and ball set purchased at Dollarama, my local dollar store for $2. However, it’s easy enough to fashion a club from old cardboard tubes or other such items you have hanging around the house. For balls, you can even just wad up some aluminum foil to use in a spur of the moment pinch! Make the course a little more challenging by adding things like this little ramp inside the cardboard box tunnel – it was fashioned from the flaps cut off of the box and secured in place with more duct tape. You can even add some pie plates or similar containers of water or sand around the course to serve as "hazards". There are a number of options you can use to create the holes for the golf course. Here, I’ve used plastic pop bottles. I cut off the bottom of them and then cut an arch like opening into one side. You can just label the number of the hole onto the bottle itself or create a flag like I did here. I used an old ruined paintbrush as the stick for my flag but dowels or even just sticks lying around your backyard can work too. I made the flag out of more duct tape but fabric scraps are a great option. I hope you’re having a great summer of family fun with your kids! I’d love to hear about your favourite ideas for inexpensive and easy to do family activities. Feel free to visit me at my blog or drop me an email! 1.) Dollar Tree had a golf club and ball set for $1. I was there this week for the first time in months, I am now kicking myself. 2.) How awesome is this idea?! I have two siblings that are 13 and 11, and this seems like something even they would like to do, as well as my kids. Or maybe we could do this with cousins? TOO FUN! 3.) Thanks, Cyn for guest posting! Wow, those are cute golf ideas. Hmmp I am thinking of making those.